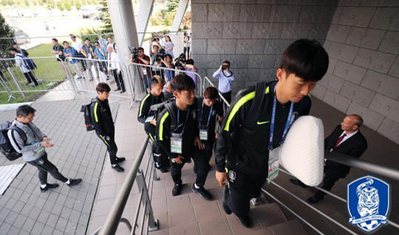 Korea is predicted to come 26th among the 32 countries to compete in the upcoming World Cup in Russia, sports marketing and analysis firm Team Twelve said on Sunday. The company's Alpha Ball system uses data derived from recent matches in 20 categories such as average attack success rates and attack and defense patterns, to rank each team's chances of success in the tournament. 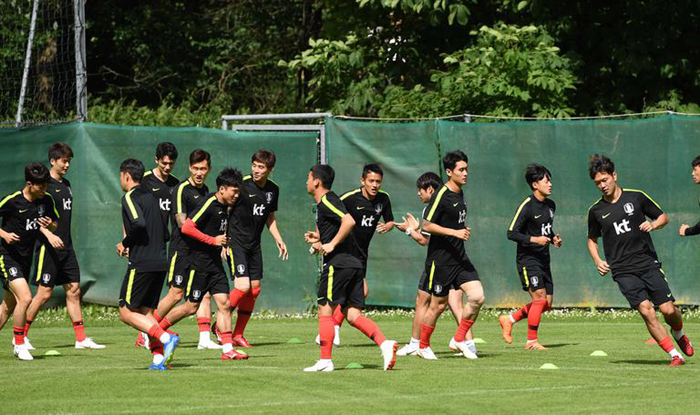 Korean footballers practice at a stadium in Leogang, Austria on Sunday, a day ahead of Korea's final World Cup tune-up with Senegal. Korea received 3.7 points out of 10 in an evaluation based on matches from March to June 10. Host country Russia tied Korea in 26th place. Brazil, with 9.4 points, is projected to win, followed by Spain with 8.4 points and France with 8.3 points, while Peru is expected to be the surprise sensation of the quadrennial football event. In the group Korea belongs to, Germany received 7.5 points and Mexico 6.0 points. Sweden, a European powerhouse, got a disappointing 4.1 points due to a recent run of poor performances. The program forecast that Korea will finish the World Cup with one draw and two losses after tying with Sweden and losing to the other two teams. It predicts Germany and Mexico will advance to the round of 16.